Elvis Enthusiasts Unite: For a good time, crash a small town music festival. For a good time, crash a small town music festival. Call it a restlessness of spirit if you like, though I can’t quite come up with a solid reason, not yet. It may be too easy to chalk it up to this passion for adventure, this reason I live. It could be this desire of late to live the proactive life, happening to it as much as I can get away with, rather than that other easier way around. But there was a day this past weekend where I allowed the wind to lift me up and take me wherever it may. And I obediently did so. It’s part of living the unhurried life. There was the Canaveral National Seashore, a beach so far from beach houses and all that attach themselves to that culture of sand and sun that nothing else exists; it’s not allowed. I drove until I ran out of road and hoped it’d be just me and that nature and some thoughts, but a couple fishermen beat me to that kind of solitude. Got there just after 6:30 in the morning, a touch before the sun. Looking either way down the coast, I saw nothing but coast and surf. Saw and heard hundreds upon hundreds of birds flying by in a never ending line and it was so quiet, I could hear the distinct, thrilling sound of wings flapping above my head. I was able to be. Once the folks started showing up without their swimsuits (including one jolly old man who eventually wore nothing but a ZZ Top beard), I figured it was time I made my exit. I mean, I walked away barefoot to make them feel more comfortable around me, sure. I’m nice like that. But this story isn’t about that morning. It’s not even about driving to Cassadaga with a curiosity after that, being offered a reading by one of the mediums there and politely refusing. I wasn’t in the state of mind for that. On my way to the beach, I’d seen a sign for a town called Samsula. Only two days before, I’d come across a tiny blurb in the newspaper advertising a weekend-long Polka Festival there and, yes, it was the sort of thing to interest me. I read the newspaper more dutifully on the weekend than I do any other day of the week, lest I miss out on an opportunity. Case in point: Samsula, a wee blink-and-miss-it kind of town. I drove back to the sign and figured out where the lodge was (just past the ‘Boiled P-Nuts’ truck on the corner), promptly dropped my 10-spot and parked “wherever I liked” on the grass, as instructed. Passed by boxes upon boxes filled with polka compact discs, slipped through the doors and, just like that, I took a large step back in time. I was suddenly one of the youngest guys in the joint, as there were tables filled with old folks in pastels and owning up to gray hair and no hair and pants pulled so high. People were happily eating plates piled high with sauerkraut and homemade sausage and chatting loudly. No one seemed to be acting very old. In fact, the dance floor was being used to almost full capacity (and they could dance!) while a band in from Cleveland was providing the requisite polka music and double accordion action up on stage. I’m not sure what it was I expected. Or why I was there. I’ve a) always had a penchant for the polka music and b) played the squeezebox for a whole year straight without ever mastering it very well. And, yes, everybody knew everybody else and, yes, it didn’t take long for the lodge owner to ask me who I was and what my business was there. The good part is that we know each other fairly well now. It was like I’d crashed some kind of high school reunion. I didn’t look like I belonged, yet I didn’t feel out of place. And, in a period of my life not entirely filled up enough with very lasting connections, I felt like I found a few of them there. There were dance steps that had been learned much earlier in these lives and still nimble feet that hadn’t forgotten a single step. There were songs sung in a tongue I didn’t understand (though Slovenia was the country referenced most often) and sometimes up to 16 accordions being played at once, completely in unison (!). There was an 89-year-old mother of someone, now confined to a wheelchair, who a few folks decided to spontaneously sing to as she tried her best to sing along and clap. There were perogies and corned beef and sausages in the kitchen in back. Scenes from a time gone by, all of them. The thought struck that, while I don’t have a love of my life (not in that traditional sense), I felt something akin to real love in this place, love that had lasted through wars and heartbreaking trials and more than I can ever attempt to fully realize. It never really seemed to matter that everyone thought I was someone’s grandson and why hadn’t I been to the past two days of the festival and really? I found out about this whole thing in the newspaper and didn’t know a soul? I came a spectator and left having made some friends. 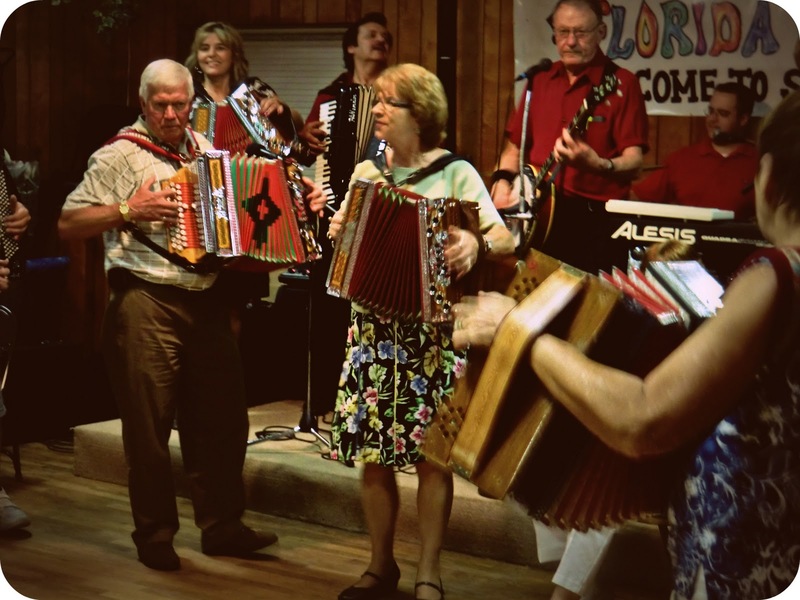 Friends who enjoy the polka music are few and far between, after all. And I didn’t even have to join the rest of them on stage with an accordion. This is the single most awesomest thing you have done in FL to date. It is so you to crash a polka party. I love it! I just wish I could have seen a picture perhaps from the other side of the room--the one where you stick out like a sore thumb. Would cause a chuckle or two. Oh my -- thank you for this. My Polish grandfather loved his polka music, and I loved obliging him many spontaneous dances. Consider this post Polish-approved. Here's to accordians and happenstance. Thanks, both of you. Polka will not die. Polka forever! I love that top picture.